Hrm. Anyone wanna learn KSP modding with me? I'm thinking about making an advanced generator module plugin to support things such as non-resource inputs (solar, g-forces, location, vessel state), inactive vessel work, and a larger variety of output options (ratios, waste vs constraint, input-output grouping, science). But frankly I'm sick of programming without people to talk to and bounce ideas off of. I'm making a planet pack plugin. I can name a planet after you if you want. Hangout this weekend then? I've got monodevelop and unity installed. ...I should probably mention that I'm new to C#. Edit: Sorry planet, had a computer blow up and the mojang EULA crap kept me posting during the little time I had leftover. Another time? It's easy to say that mods like B9 Aerospace or even Krag's Planet Factory are the best mods evarzzz!!! !111!one!, but it's "tiny" mods like these that really make me impressed with the KSP modding scene. Heh, that is a nice one. If my current set has some ram wiggle room I'll have to add that in. I tend to look at the little ones too. I recently found a little scoop and a camera that lets probes do crew reports and soil samples. Should be nice after a wee bit of tweaking. Been a month since I actually played so I'm getting updates/alternatives for the mods I had. If anyone wants to help I'm looking to make sure all the mods interact nicely (KAS grabbing for small parts, tech tree integration, resource storage and usage, ect...) and turn it into a modpack of sorts. You can have my mod. KSP peaks my memory usage system wide to 90%. Big ol' memory hog mod is the last thing I need. Only reason it peaks that low is I've got the memory reducer mod set to aggressive. So far all my mods are working nice. Probably going to swap out mechjeb for kerbal engineer if only because with remotetech it can still stage and do other commands to a probe with no connection. Also need to tweak some unlocks. The airship drone in the hooligan labs thread unlocks a powerful RTG and probe core with basic rocketry, the first node you unlock. That is what I have needed. Does it incorporate science? Doesn't say in the OP. Edit: Porry, your pack is breaking my beast of a computer, are there any incompatibility issues with other mods? Edit3: Not enough memory, guess I'm playing with too many mods. Been tempted to get KSPI but not sure how it will work with what I already have. Though due to remotetech blowing up two careers so far (did not know of the community fix from the 10th he just updated the thread with) I know a good progression to getting started on my first station. I can run it with KSP interstellar and Final Frontier. Download the latest version. I optimized it and removed redundant textures. Remember to uncheck "load Sentar expansion" when the game boots. I just patched it so that you don't need any of Krag's planets to run the pack. No science at the moment, as I am still placing in messages. Also! My pack now has more planets than vanilla KSP! Hooray! I did have the latest... Am I doing something wrong then? Remember to uncheck the load Sentar expansion box. Remember to delete the Abaddon folder before updating the mod. The old textures are probably still in there. I did and and I just got the pack new last night. How do I launch a small communications satellite into a stable 50k m orbit? I've launched one rocket in my KSP career and the orbit was really odd, as in 40k m on one side and 60k m on the other. Is there an easier way than strapping on boosters and turning right? My failed probe was fun to de-orbit though. Deadly reentry would be fun for deorbiting stuff. I've got two projects after work. Make a set of parts for extraplanetary launchpads (using included models since I can't make em) to convert ore-metal-shipparts that is smaller, lighter, and less energy efficient than the current massive parts. Decide whether to continue with the save I have and grow out my com-array or get B9, deadly reentry, and FAR and try a new one, possibly streaming it. Stable 50km? Never. Atmosphere ends at about 70km. That's the minimum for a stable orbit. To get into orbit, fly up to about 10km straight then start slowly turning right (about 1 degree every few seconds). Then go into your map view and continue to boost until your apoapsis is at your orbit height (At least 70km). Then cut power and turn your ship parallel to the ground and wait until your at the apoapsis then burn prograde. Cut the throttle once your periapsis matches your apoapsis. Your in orbit!!!! Ok, then my problems were that I started my gravity turn to early and went for too low of an orbit. Get kerbal engineer or mechjeb (or both). You need something like 4000 dV, with a minimum of 1.5 TWR across all stages to get a good stable orbit. Also, keep your speed in check if you overbuild your TWR (more than 2). Going above 200m/s under 10km is wasteful due to friction losses. And going too far under 200m/s under 10km is wasteful due to friction losses. But don't go over 200. It's the worst kind of friction loss between the two. 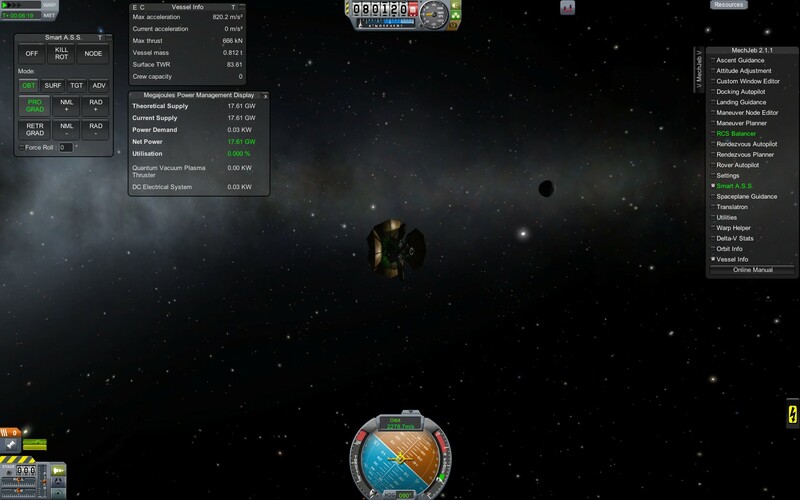 Also, for a stable 80 km orbit, you need about 4600dV. TWR can vary. Momentum helps a lot when you're in the upper reaches of the atmosphere, so a TWR that starts just under 1 for your orbiting stage won't hurt you too bad. And in outer space, TWR is barely relevant. There, your efficiency matters a lot more. I'm burning for Jool right now with only 1.37 m/s, with an isp of 155 000... Interstellar is so much fun! I knew my dV was a little low for orbit. What I really want is a fairing mod. I think that's a major shortcoming of KSP. Of course it doesn't matter until a realistic drag system is implimented, but stuff could look so much more realistic with it. I mean really, are rovers just stuck on the top of a rocket? haha, no, they have to be protected! Don't worry, I won't boom it. KSP causes enough explosions as it is. Thank you. Jebidiah would have been grateful if someone >_> hadn't already blown him up. Those both look really cool, I'll try them out when I've used the vanilla game a bit more. I want to at least go to the mun before adding mods.